The monastery was founded in the second half of the fourteenth century, a period marked by spiritual vigour in Byzantium but also by considerable political and ecclesiastical unrest in the Reigning Polis. During that same period the Serbs under Stefan Dusan seized extensive lands in Macedonia, and the Turks made their first inroads into the European continent and took Gallipoli in Thrace. 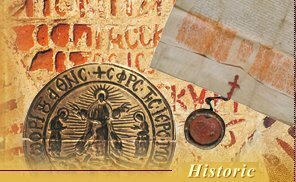 A strong argument in support of this chronology is based on the fact that at a short distance from where the monastery stands there earlier stood a monydrion dedicated to Christ the Saviour, dating from the eleventh century. Christ Pantokrator. Portable icon originally from the Monastery of Pantokrator and now exhibited in Hermitage museum in St Petersburg. Fourteenth century. According to existing sources, and in particular the older documents kept in the monastery, the founders were two dignitaries from Constantinople who became militarily active in Macedonia during that period, namely the brothers Alexios and John who at the time of the monastery’s foundation bore the titles of Great Stratopedarches and Great Primicerius respectively. Their successful military operations together with their connection by marriage to the Emperor John V Palaeologus made them owners of extensive lands in Eastern Macedonia (Chrissoupolis, Christoupolis, Anaktoroupolis, Thassos), a large part of which they later ceded to the monastery. In 1365 they were governors of Christoupolis (now Kavala) and took special measures for the security of the areas they controlled. The ruins of the once imposing tower of Marmaras at Amphipolis, on the left bank of the Strymon River, bear physical witness to their efforts. The tower, built in 1376, came into the possession of the monastery before 1384 as is evidenced by a very important inscription found on a tablet originally to be seen on one of its walls, but which has now been removed. This inscription mentions the “new monastery of Pantokrator” (presumably meaning “new” relative to the other one in Constantinople that dated back to the eleventh century) as well as the names of its founders. The exact date of the monastery’s foundation is not known to us. However, it is assumed that building work started before the year 1357 and that the monastery was formally founded sometime between April and August of the same year. In that same year (1357), the Emperor John V Palaeologus and Patriarch Callistus I, by a chrysobull and a sigillion respectively, ratified the grant by the Protos Dorotheos of the kelli of Rabdouchou (which had earlier been a monydrion) to the two brothers. This kelli was subsequently annexed to the monastery after the latter’s establishment. The name of the monastery also appears in Athonite documents of the years immediately following. According to a preserved inscription, its katholikon was consecrated in 1362/3 by Patriarch Callistus I who declared the house patriarchal, while as from 1367 the monastery has also been referred to as royal. This same Patriarch Callistus I drew up a typikon (set of rules) for the monastery, which unfortunately has not survived. In it he set out provisions for the independence and coenobitic status of the monastery, as well as instructions for the spiritual advancement of the monks. 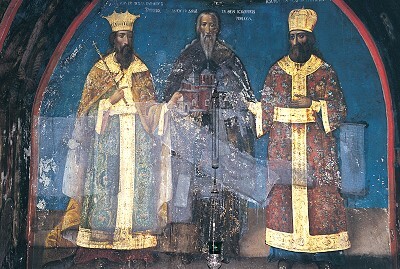 The founders of the monastery Alexios the King, Monk Ioannikios and John the Great Primicerius. Mural above the founders’ tomb in the katholikon. 1854. The unstable political conditions and the successful military operations of the Turks led John to apply for Venetian citizenship. The Venetian authorities granted it in January 1374, but he never made use of it and he never took refuge in Venice. Instead, he remained in Macedonia and continued to defend the Byzantine acquisitions he controlled, such as the Marmarolimenas in Thassos where he built a tower and fortifications, as well as the estates ceded to his monastery. He remained active at least until the end of 1384 when he withdrew to his monastery where he spent the last years of his life. The monastery’s tradition has it that John was tonsured a monk and was given the name Ioannikios. A monument commemorating his time in the monastery and his repose in about 1386-7 is the “Tomb of the Founders” which is today located on the north side of the exonarthex. A false sarcophagus was placed in front of the tomb. Dating to the fourteenth century, it survives to the present day.